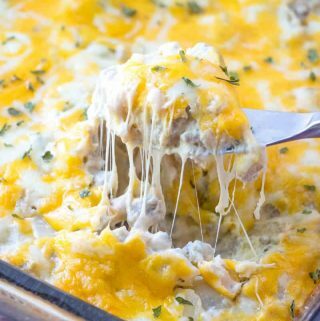 In large skillet cook your sausage over medium heat, when sausage is halfway done add your onions and mushrooms and cook until onions are tender, drain. Add in your cream cheese and stir until meled. In bowl mix together both cheeses. Stir in your mayo and then add 2/3 of the cheese. Spread into a 9"x9" baking dish and sprinkle with remaining cheese. Bake for 20 minutes or until dip is bubbling and golden. Serve with diced bread or crackers.